The company had hoped to fetch big prices on ads appearing in the feature, but advertisers are choosing to spend elsewhere. While there's still some hope that Twitter's (NYSE:TWTR) Moments feature will help with user engagement, it's reportedly been a flop with advertisers. That's important news for the social site and its investors, especially since it had high hopes for Moments -- a section devoted to highlighting trending topics -- when it launched the feature about six months ago. Twitter had envisioned Moments commanding premium ad dollars as the company asked for $1 million commitments from companies on "promoted Moments". The Moments story seems to be following a familiar script. Even though the site remains a popular -- albeit slow-growing -- destination for people looking for live news and events, Twitter is struggling to find its place with advertisers and seeing them slip away to other platforms. That's troubling for a company that relies on ads for some 89% of its revenue. 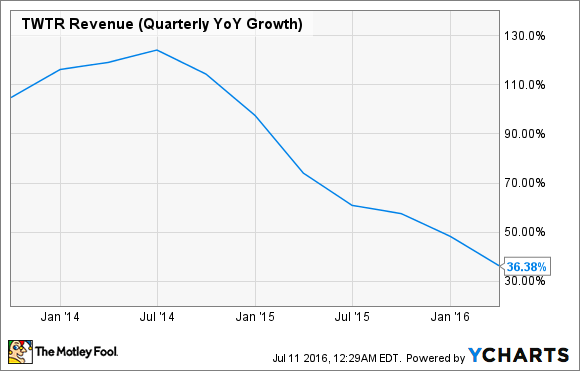 A look at Twitter's quarterly revenue growth doesn't inspire confidence moving forward. Making matters worse, Twitter is watching its biggest rival, Facebook (NASDAQ:FB), sprint ahead and smaller, younger competitors like Snapchat quickly gaining ground. What's perhaps even more troubling about Moments' failure to attract advertisers is that it's a similar feature to Snapchat's Live Stories, which have been a success for the company. One of the big issues plaguing Moments -- as well as other forms of Twitter advertising -- is advertisers' return on investment. Companies that are winning the digital ad war -- i.e., Facebook and Alphabet -- are continually figuring out how to measure ad effectiveness in more meaningful ways for the companies that spend money on their platforms. To see how far measurement has come, we don't have to look any further than Facebook's recently announced effort to show stores exactly how many customers who see ads are following up with store visits and purchases. Those kinds of advances in measurement are no doubt among the reasons why Facebook's revenue growth is picking up as its rivals' cool. On top of that, its advertisers have been reporting solid return on investment in video ads. And Twitter has been so encouraged by what it's seen on that front, it is looking to shift more advertisers from traditional sponsored tweets into video ads. So, the company appears aware of the problem but given what it's up against, Twitter has its work cut out for it. But Moments' failure to attract advertisers shows the company's key struggles remain. 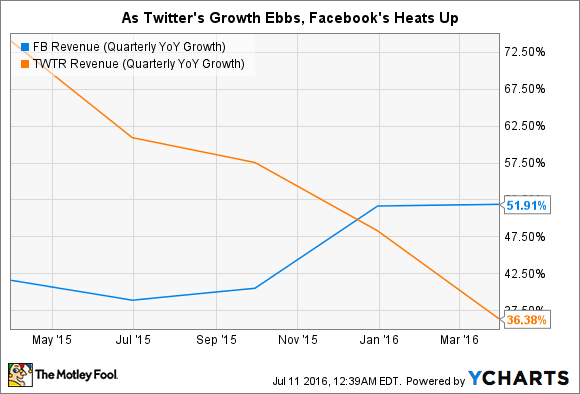 We should expect bumps in the road for Twitter, just as we should with every company. Even great companies roll out products and features that turn out to be clunkers. But Twitter's story in recent years seems to have been built on one misstep after another. It's the type of story that leads to an influential investor like Chris Sacca calling the company out this April as "a series of missed opportunities".